This is the introduction to a series of posts on our favorite chapter books for young (age 10 and under) black boys. Please share, link, and re-post anywhere and everywhere! Every school and town library in our country needs to have these books on their shelves! So, over the past nine years I’ve spent an enormous amount of time and energy researching and seeking out books which reflect black culture, possess rich black imagery, and highlight strong black characters, while at the same time being good, plain-and-straight-up, awesome books. Luckily, we are living at a time in history when such books do, in fact exist. Unfortunately, these books are not always so easy to find. In the past couple of years, Kyle and Owen have been gradually making the shift from picture books to chapter books. Now, at age 9, they have sincere appreciation for a good chapter book with black main characters. It has been very clear to me that they prefer (greatly prefer) chapter books with black male characters. This is no surprise, of course. But an interesting twist is this: there are many, many more chapter books targeted for black girls than for black boys. I’ve had to do some pretty deep digging to come up with really good chapter books with black main characters. In this series of posts I’m going to list our Top Five Favorite Chapter Books for Black Boys. I’m focusing specifically on chapter book series here. These will be posted in order, from Kyle and Owen’s favorite (#1), to their 5th favorite (#5). Bear in mind, all five of these sets of books are superb! I am simply listing them in rank order of my own boys’ favorites. Also, note: I have personally read every single one of these books right along with Kyle and Owen (we are big believers in reading aloud as long as our kids will let us). I can personally vouch that they are excellent chapter books! I hope these posts will be useful for black boys, their parents, their extended family and friends, their teachers, their librarians, and their communities. If you’re looking for great chapter books for the black boys in your life, I’ve got you covered! Enjoy! *This is a subject that I have thought about a lot, and on which I have done a lot of research, so please (please!) don’t leave mean and nasty comments about how uptight I am about this. As far as I am concerned, this is a topic that is not up for discussion. 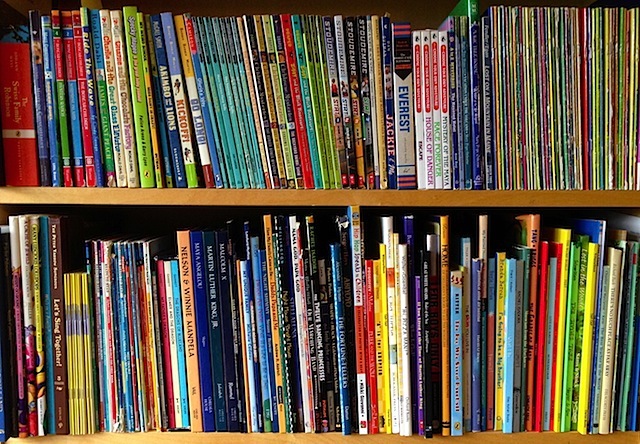 If you don’t want to know about great books for black boys, then simply skip these posts. Please (please!) don’t waste your time or mine by telling me that I’m wrong for being so adamant on this subject, or by telling me what a hypersensitive person I am for taking the stance that I do on this. I am a sociologist and a mom, and I’ll tell you this: it is what it is folks, and whether you want to believe it or not, things like this (providing books with black characters for your black children/students) do, indeed, make a difference… a big, big difference. You are absolutely right about the importance of black male characters in books for black boys. And you’re doing everyone a huge service finding these books. There should be some way for you to put this information out to a bigger crowd. I am so glad you are doing this series! I will definitely be taking notes. Regardless of skin color we all would benefit from reading books with strong black male characters. Thank you for all of your work and for sharing it as well!! You are so right about seeing people that LOOK like you in books and other forms of media making a difference. It can be hard to find POSITIVE images and stories. Many people don’t understand it because most of the faces look like them, so it’s not even an issue. I remember in the 70s my mother colored Santas and angels brown for me and my sisters. It meant a lot to us. Your boys will so appreciate your efforts when they are older. I don’t think you are being an uptight mom by wanting to select books with black main characters for your black sons. I think parents need to do what they feel is best for their family and likewise, be respectful of other families’ decisions. No nasty comments are necessary. We happen to seek out the same types of books for our boys, although we also encourage them to read books with non black characters, too. For our family, we prefer to present a balance of all types of books. I look forward to learning which books your sons have selected as their personal favorites! I’ve been a long time reader, but I’ve never commented. This topic touched close to home. As a black 3rd grade teacher I am constantly looking for ways to enhance my classroom library so as to reach all of my students. I absolutely love that you make a point to expose your boys to black stories/books, and I agree it is so hard to find positive and influential books for black boys to read. I’m looking forward to following this series…my students will thank you! We try to mix it up. I look for books with black main characters and we also try to read the classics (“Alice in wonderland”, “the lion, the witch, and the wardrobe”, etc). I’ll definitely look at your list for my son and the upcoming holidays. Have you considered working with the school to have some of these authors as guest speakers? I think that would be very exciting for your sons and also give them opportunity to ask questions of the author(s), particularly about development of the stories and the characters. I also believe that seeing authors, particularly if they are black authors, adds a dimension to learning as these individuals then become role models. Thank you for sharing! I am excited to introduce these into my son’s life. Have you found any books where black males have interest other than sports? Any books about boys who like to camp, hike, learn about nature, or have other such interest. I am concerned that my Haitian grandson only sees black males as sports figures and not scientist, college professors, lawyers, etc. Thanks so much Heather, I hope you receive a lot of support and no nasty comments! You are completly right, it is so so important for Black Children to see people of colour in their books and to read about other children like them exploring the world and to see Black Representation. And I am so in awe of the time and commitment you do to make this happen — it is a great service to the community online and offline. I’m bookmarking these pages and hope one day I can pass these book reccomendations on. I remember my Mum used to order books from Letterbox Library Mail Order catalogue — Amazing Grace was a favourite http://www.amazon.com/dp/0803710402/ref=rdr_ext_tmb. Thank you for sharing. I plan to add some of these to my twin’s Christmas stockings. Even when I only had two white birth children and no adopted children, I made sure to have African American dolls and books (Amazing Grace, Peter’s Chair, A Snowy Day, Jamaica Tags Along, Jamaica’s Find etc). Also, you may want to check out the Facebook group Transracial Adoption. It is a group of adult adoptees, adoptive parents and some adoption professionals discussing transracial adoption. There have been a number of interesting threads over there. While most of the group is white adoptive parents, there is a stronger adoptee voice there than any other group I have found. This list would certainly be appreciated there. I appreciate your research on this and for sharing it! I have twin 7 year olds from Haiti and they love to read!! Can’t wait to get these for them. I love these posts. As a white family in a diverse school, this series really made me think about the books that are in my son’s classroom. My boys love to read, but we become discouraged by the lack of great books for boys. I never looked at it from this perspective. Thank you for that. I am going to add these books to my teacher gift list as well as my own wish list. THANK YOU, Heather!! I’m going to put all of these books in queue for my reading-averse little man. The pervasive sports themes are actually a welcome thing for us as we try to instill a love (or at this point, tolerance) of reading in our sports-obsessed guy. Sent the link to our elementary school librarian. THANK YOU! My boys have a summer of fun reading ahead. You have made a great contribution to our growing library for them. Again, Thank you! Heather, thank you so much for this very helpful post!! I recently started volunteering to read with second grade African American boys. I have been looking for books with black characters and keep finding somber picture books about weighty subjects. You have steered me toward books with fun and relatable characters for these boys. I am shocked of the derth of fun chapter books for young black males. Blog posts like this are important because they call attention to this problem, so THANK YOU for writing it!! Thanks so much for this list! I’m shopping for Christmas gifts for 11 3rd to 6th grade boys, nearly all of whom are African-American, and I love the books you and your boys decided to include! I just wish you’d included Amazon links so that you could get credit from me buying them. Thank you, thank you, thank you! This is my first post EVER, but I felt so strongly about this topic I had to. I totally and completely agree with your opinion as a mom of African American boys. I have recently adopted 2 bio brothers and I am also ADAMENT that all things brought into our home reflect what we look like. We are moving from picture books to chapter books and we needed this list. Thanks again! I am so glad you have these books listed. I needed books for my grandson. Keep it up! I just happened to stumble across your blog while researching “books for black boys.” As a garduate student of Literacy at Clemson University and a 4th grade teacher in Upstate South Carolina, I want to say thank you for this fine collection of resources! Everything that I have learned in my program further reinforces your beliefs that readers are more engaged when they can relate to a book’s characters. Of course this may not always be through race, but books with similarities in age, interest, race, and background are always a good place to start, especially with a reluctant reader. I too, am a huge fan of the Julian series, but I look forward to incorporating your other selections in my classroom. Thank you for sharing!